This diagram outlines the key steps in Second Nature’s framework for resilience planning. See the Commitments Implementation Handbook for an example timeline for completing these steps for the Climate or Resilience Commitment. Second Nature’s framework encourages schools to not only assess and reduce vulnerability, but also to assess and enhance overall resilience and adaptive capacity. Campuses should go beyond managing extreme and potentially catastrophic events; they should proactively plan for preferable futures. These key steps appear to be separate and linear components of resilience assessment and planning. In reality this is an iterative process, and campuses may be working on several steps at once. It is not possible to be a resilient campus without being part of a resilient community. All campuses interact with some form of external community and share resources across campus-community boundaries. A requirement of the Climate and Resilience Commitments is to coordinate resilience planning and implementation with the community. Many cities, towns, and neighborhoods already have resilience-focused efforts in place. Some may already have existing Resilience Plans. 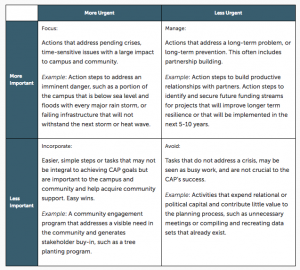 Campuses are not required to write a resilience plan for their town or city, however it is important to be aware of efforts happening in the community and understand how they may align with campus goals and progress. In some cases campuses may comprise the majority of a town’s population and resources. If they have the capacity to do so, colleges or universities can choose to create a joint campus-community resilience plan that includes shared goals and indicators. It is up to each campus to set the boundaries of what they consider their “community,” and to determine the best way to coordinate around climate resilience. The resilience assessment is meant to provide a baseline of current resilience activities on campus and in the community, develop initial indicators of resilience through a multi-stakeholder process, and identify current vulnerabilities related to climate change. Understand strengths and assets on campus, in the community, and across both. Understand weaknesses and vulnerabilities on campus, in the community, and across both. This includes climate change hazards, impacts, and existing conditions that may be exacerbated by climate change or affect a school and community’s capacity to cope and adapt. Develop initial indicators of resilience that help benchmark current status as well as identify where a campus and/or community hopes to improve capacity in the future. Identify key overlaps and gaps between the campus and community assets and vulnerabilities. There are many approaches to completing an initial campus-community resilience assessment. Schools should tailor the comprehensiveness of their assessment to the capacity of the staff or committees doing the work. For the purposes of fulfilling the Climate or Resilience Commitments, the assessment could be part of a short workshop, a series of longer workshops, interviews and surveys across the campus and community, or part of a different process the campus develops. Whether campuses are organizing a workshop, conducting surveys, or developing a different process to complete the Resilience Assessment, it is important to incorporate the views of a wide range of stakeholders. Capturing input from many stakeholders will help campuses understand all the dimensions of resilience, ensure no major vulnerabilities are left out of the assessment, and identify a broader range of opportunities. As part of a workshop, ask people to write down their ideas of strengths, assets, and vulnerabilities on sticky notes and place them on a large poster. After the initial ideas are there, participants can use colored dots to vote on which ones they agree with. This is a great way to engage a diversity of participants and get very different ideas of what people consider to be assets or vulnerabilities. Second Nature recommends that campuses begin the resilience assessment process by identifying current strengths, capacities, and existing resilience activities. This process may also include envisioning ideal future scenarios, so that campuses and communities have an idea of what a preferable future might look like. Starting with vulnerabilities means decisions tend to focus on reducing negatives. This can limit the opportunity to create more rounded, long-term, multi-faceted and ongoing resilience efforts across the campus and community. When campuses address vulnerability before considering where the campus and community want to be in the future, they tend to assess future vulnerability based on current systems and infrastructure. For example, planning for the level of heat waves expected in 20 years should be in the context of the civic and campus systems expected in 20 years. In other words, focusing on building a resilient system can be more beneficial than reducing individual vulnerabilities. Strengths and assets include features, capacities, characteristics, and resources that will help a campus and its community cope with climate change. The strengths and assets that the campus and community identify during the assessment are likely characteristics that should be continually reinforce and improved going forward (e.g. wage equality, recreational space that also protects against flooding, a healthy community). These strengths and assets will help the campus and community adapt and thrive in the face of climate impacts. Campuses may choose to incorporate scenario planning exercises as part of the initial Resilience Assessment as a method to envision ideal future scenarios. This can help create a shared understanding of the type of future that is desirable for the campus and/or community. Scenario planning enables a campus and community to explore a range of futures and weigh the associated opportunities, benefits, challenges, and expected vulnerabilities. It can help bring to light common values, and identify a positive vision for the future. However, this is not required to implement the Climate or Resilience Commitment. Many communities have already been through scenario planning exercises. In this case campuses can use the information to inform resilience planning. If the scenario process did not involve the college or university campus, schools may want to organizing their own campus version to assess the role of the institution in the future of the community. If a community has not already been through a scenario-driven process, it is recommended to spend some time considering what an ideal future may look like. This could be a brief “visioning exercise” as part of a resilience workshop, or it may be a more in-depth process itself. There is no single way to complete future scenario planning. Below are some steps that can be included. Tip: Clearly articulate the end goal for the process and be clear about the geographic boundaries. Example: we want to focus on scenarios for 2030, create several scenarios and compare futures while keeping options open. This will be for the campus and city. Example: we want to create several scenarios and converge on one main scenario. This is just for the campus. Instead of starting with the whole community or campus, it’s possible to start with being a ’water resilient city’ or a ‘transportation resilient city’. While Second Nature encourages systems thinking, beginning with one theme will still touch on many of the areas of resilience capacity. This may be a more manageable process for those who are new to this effort. Identify the stakeholders and ensure there is a communication plan to reach them. While the process should be inclusive with underrepresented groups present, there is also appropriate balance between inclusivity and too large a group to be productive. Some schools organize a series of stakeholder meetings, and some do just one or two workshops. Schools should decide based on staff, budget and the amount of joint effort possible with the city or community. Set a timeline for the scenario process. Before the workshop, create a scenario that includes a future campus and/or community that reflects development continuing as expected, demographics shifting as expected, and climate changing as expected. There are many ways to do this, but consider starting by understanding what the participants think are strongly-held community values. This can include asking some either/or questions to gauge priorities. The answers may start to yield insights about whether there is more focus on economic development, natural resource conservation, social enhancement, etc. Use the information gathered during the workshop(s) to generate one or more future scenarios. This may be an opportunity to utilize experts at the college or university. What are the high priorities of the future scenarios? What policies would support these priorities? What are some of the implications for the campus and community? At this point, campuses should share the ideal scenario(s) back with the community. Now that there is a vision for the future, campuses can assess specific threats to achieving that vision. This likely includes climate changes and associated vulnerabilities that may impact the feasibility of the ideal scenario. Arizona State University included a future visioning exercise as part of the Resilience Assessment. This blog post briefly describes how a shared vision was created and incorporated into the Resilience Assessment process. Campuses also need to identify weaknesses, and current and future vulnerabilities to climate change. This includes vulnerabilities both on campus, in the community, and across both. The weaknesses or vulnerabilities identified will be things to reduce or eliminate going forward (e.g. residents in floodplains, lack of weatherization of community housing, obesity, poor air quality days). Vulnerabilities may include direct hazards from the changing climate (such as drought, heat waves, and severe storms), and impacts from climate change or related events (such as infrastructure failure and disease outbreak). They may also include existing factors that are exacerbated by the effects of climate change, or that reduce a campus and community’s ability to cope and respond positively. For the initial resilience assessment, some campuses may choose to focus on a high level understanding of vulnerabilities from the experience of various stakeholders, while some may complete a more in-depth vulnerability analysis. Both of these strategies are important. Campus and community stakeholders will understand vulnerabilities from their own perspectives and experiences, which helps ensure the needs of all community members are included. At the same time it may be necessary to complement this with a data-driven approach to further capture vulnerabilities. The exact extent of the vulnerability assessment will depend on campus capacity. A campus may also do an initial review of vulnerability towards the beginning of the resilience planning process, and complete a more detailed vulnerability assessment later as it incorporate resilience into a Climate Action Plan. Schools can look at past weather and climate events along with other stressors the community has experienced and do a preliminary analysis of impacts. Most communities will have events in the last couple decades to draw on – from snow emergencies to flooding, storms, and heat waves. Non-climate events such as widespread power outages or transportation failures can also be instructive. Campuses likely have faculty who study local events and their impacts and who can assist in providing data and information. This analysis is also a great opportunity for student projects and engagement. Schools should enlist as much help as possible from across the campus and community, drawing on existing data sets and input from experts. If there have been heatwaves – are there particularly affected neighborhoods? what was the additional death rate? is that changing over time between different events? what was the lost income (not just damage cost)? Was there associated loss of power or public transportation? Was there damage to roads or transmission lines? Was there habitat impact? Are there policy changes as a result? There are many resources that project climate changes in the United States. Federal and state-level resources are a good place to start. Second Nature provides projected climate changes by region from the U.S. National Climate Assessment (NCA). This includes climate information from observed (recent) trends, near-term projections, and future projections out to 2100. It also provides information for several different emissions scenarios. The information in the NCA and other government sources is unlikely to be as granular as the city scale. Schools may feel that this data is not detailed enough and seek out projections that are higher resolution and include a specific number instead of a range. A word of caution on this: High resolution future climate projections are not always supported by the science. Specific future values imply accuracy in prediction, which the scientific community does not currently have. Campus vulnerability assessments will need to incorporate some degree of uncertainty in projections. Framing the process as building overall resilience capacity (instead of responding to a specific expected climate change) can help reduce vulnerability to a range of possible impacts. A resilience assessment should help institutions understand where the campus and community currently stand, and lay the groundwork to develop a Climate Action Plan that incorporates resilience. Indicators and metrics are an important part of this process. In this guidance Second Nature considers indicators to be features or characteristics of the campus and/or community that the school wishes to assess. Metrics are specific values or data points that can describe the indicator, and can be measured to show progress over time. There may be many metrics that can measure and illustrate the status of any given indicator. Social Equity and Governance refers to the systems of governance on campus and in the community, levels of engagement among campus and community members, and the capacity of different groups to adapt and respond to climate change. This includes leadership, transparency and accountability, and communication across stakeholders both on campus and in the community. Campuses should consider the social fabric of the campus-community, education levels and opportunities, active networks among different groups in the campus-community, and social justice dynamics. Health and Wellness refers to the ability of different groups on campus and in the community to fulfill their basic needs. This includes access to healthcare, food, water, housing, and sanitation. Campuses should consider the availability and affordability of healthcare, including emergency medical care capacity, food and potable water, and secure housing. 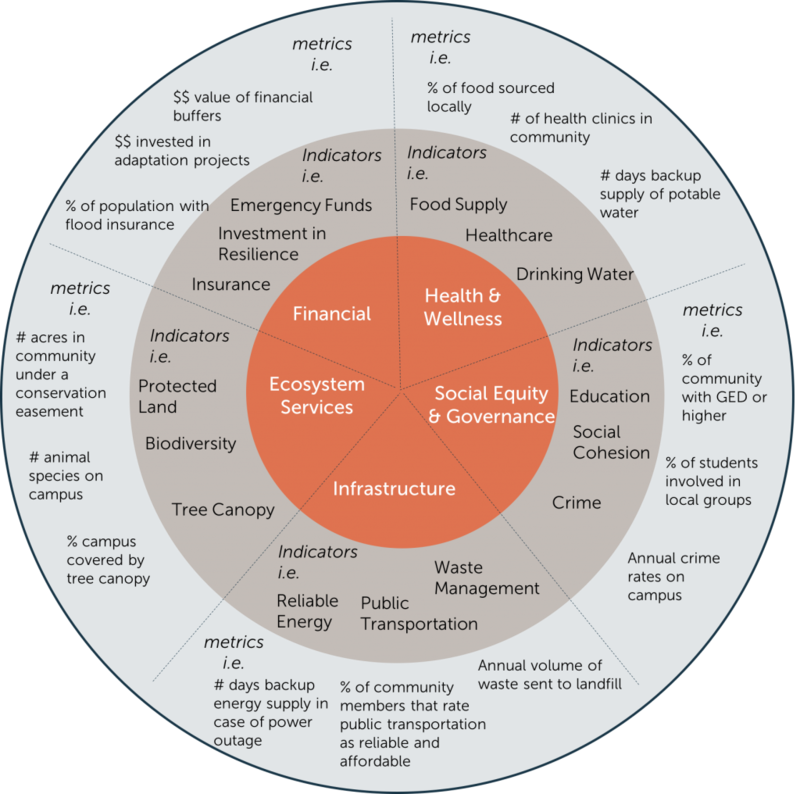 Campuses should consider indicators for health & wellness both on an ongoing basis and in the case of emergencies or severe climate-related impacts. Ecosystem Services refers to the environmental systems and services present in the campus-community. This may include the natural and geographic features of the region, city or town, and neighborhood. Campuses should consider natural assets such as tree canopy, undeveloped floodplains, air quality, and biodiversity. Campuses should also consider systems in place to govern or protect these assets, such as conservation easements, recreation parks, and rainwater management systems. Infrastructure refers to the physical structures built, owned, managed, and/or used by the campus-community. It also includes systems such as communication and public transportation. Infrastructure is often the most intuitive dimension of resilience, and many resilience assessments and plans tend to focus on physical infrastructure. Campuses should consider transportation systems, buildings, communication technology, and key features in the area such as bridges and dams. Economic refers to the financial ability of the campus and community to proactively adapt to changing climate conditions and to respond positively to climate change events. This may include high-level trends such as GDP and unemployment rates, and more campus-specific indicators such as the existence of a climate adaptation fund. Campuses should consider the diversity of the campus-community’s local economy, availability of tax or other financial incentives to increase resilience, and levels of financial planning for emergencies. Second Nature asks institutions to report on at least one indicator per dimension for the initial campus-community resilience assessment. The goal is to consider the entire social, environmental, and economic system that the campus is part of. The indicators for the Resilience Assessment are initial. Some of them may be strengths or capacities that were identified during the assessment process, and some may be vulnerabilities that need to be addressed. Institutions may also identify indicators that they wish to understand better but do not currently have all of the data on. In this case, they may report on the metrics that they plan to measure in the future. 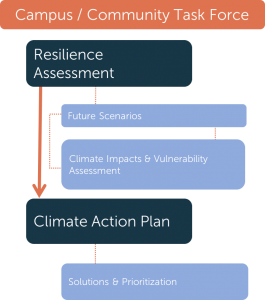 After completing the initial campus-community resilience assessment, schools need to develop a Climate Action Plan (CAP) that includes goals for increasing resilience. While schools may create a separate resilience plan, Second Nature recommends folding resilience objectives into the overall sustainability approach. The end result should be an integrated CAP that includes emissions mitigation along with adaptation and resilience. Many principles of planning for resilience are the same as planning for carbon neutrality, however campuses with existing CAPS should revisit their plans to ensure objectives are aligned and up to date. Consider whether or not the goals outlined for emissions reductions fit with increasing resilience. This may require amending some of the existing goals. The intent with this planning work is that it allows the campus (and community) systems to become more integrated and to reduce emissions while also enhancing the adaptability of the system. As with the Resilience Assessment, there is no single correct process for incorporating resilience into a CAP. Campuses should use the outcomes from the Resilience Assessment process to select and prioritize actions, set measurable goals and targets, and identify strategies for implementation. For campuses that developed a shared future vision, consider what action steps need to be taken to achieve the desired future while moderating climate risks. This document outlines how to incorporate resilience goals into CAPs, and how to complete the resilience portion of the Climate Action Plan report. Resilience can be a broad topic that touches on every aspect of the campus and community; schools will likely need to narrow down actions from a long list of potential focus areas. The scope of resilience in a campus’ CAP should reflect the capabilities of the school. This means that campuses will need to prioritize actions and initiatives that address the most pressing vulnerabilities. There are many strategies institutions can use to organize and prioritize action steps for inclusion in the CAP. The Resilience Prioritization Quadrant is one framework to help schools evaluate potential resilience action steps or initiatives. Visit the Resilience Prioritization Quadrant page for details.